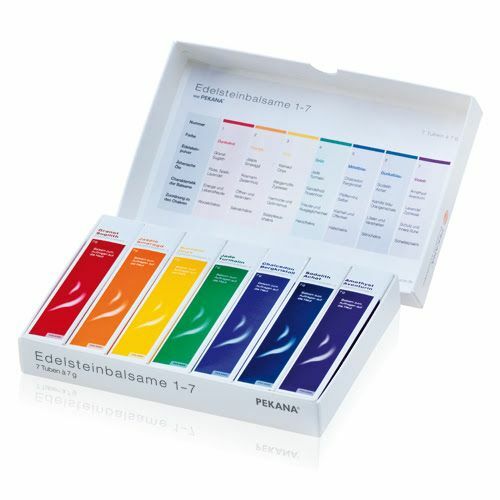 The seven Gemstone Balsams by PEKANA combine skin nurturing properties with the power of gemstones and essential oils for your daily well-being. offers seven energetic cosmetic ointments not only suited for skin care, but also for harmonizing the body's energy flow when applied to the chakra points. In addition, the balsams can be used for body massage, acupressure, foot reflex zone massage, and to support kinesiology applications. Specific conditions where the Gemstone Balsams were applied and the patient received relief include digestive upset, tension in neck and throat, hip pain, and anxiety. 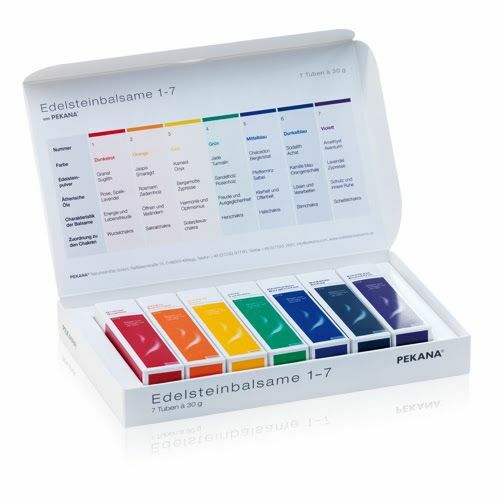 The seven Gemstone Balsams by PEKANA® combine skin nurturing properties with the power of gemstones and essential oils for your daily well-being. According to tradition, gemstones represent the harmonization of the body's ethereal energy flow. The gemstone balsams are not only suited for use as skin care products. In addition, they are frequently used to support kinesiology applications and for energy work. a local energetic impulse is placed on the skin, which is supported by the circulation and resorption promoting effects of the essential oils. As a result, the crystal energy should be transmitted to the olfactory center with the aid of the essential oils and be sensed there. The olfactory center is closely linked with the feelings that significantly contribute to our well-being. and transform material influences in such a manner that they can be grasped emotionally and intellectually. Each Chakra is assigned to particular organs or glands. specific energy center. Small quantities are already sufficient to achieve the intended purpose. It is important to consciously appreciate the aroma following application of the gemstone balsam. sensitive. This enables all areas of the body to be approached over the reflex zones. Even pregnant women can use the balsams, since the concentration of essential oils is extremely low. Sparse application of the balsams is sufficient. ingredients, preservatives, artificial colors and aromas as well as mineral oil derivatives. Every gemstone balsam combines two gemstone powders each with two essential oils. The following explanations describe some of the properties and the application spectrum of the gemstone balsam. pleasant scent of the spike lavender rounds off the nurturing composition to create a lively mood. considered the stone that helps to courageously and insistently pursue goals. by the scent of the essential oil from the cedarwood. and self-confidence; the slightly sweet, lemony scent of the bergamot crowns this balsam. The black tourmaline represents the harmonious unit of body, mind and soul. This stone is also said to have protective properties against negative energies. Jade is the stone of the balancing principle. The flowery-woody scent of sandalwood oil strengthens optimism. Rosewood oil, with its invigorating properties, completes this balsam. the ages, chalcedony has been known as the 'stone of orators. peppermint plant is a refreshing and energizing scent. The spicy aroma of sage oil promotes the flow of energy and beneficially tops off the composition. claustrophobic feelings. The blue oil of the chamomile is considered to have a balancing effect. The name amethyst originates in Greece and means "sober" (a-methystos). gentle and clement." Aventurine is known as the stone that promotes relaxation and regeneration. essential oils contained in PEKANA® Gemstone Balsams are references to knowledge that has been passed down traditionally. They are not based on natural scientific knowledge.